Speaking about volcanoes in Greece, probably the first thing that comes to you mind is Santorini with its famous caldera and the island of Nea Kameni. Another sleeping monster hides under Milos where the volcanic past can be seen all over the island with its weird beaches and great variety of colors. 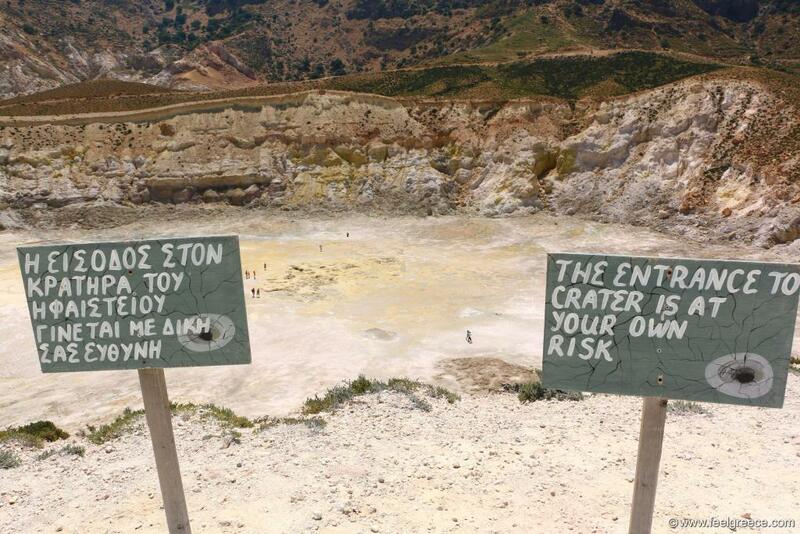 But the volcano of Nisyros island is the only Greek volcano where you can enter the crater and have a walk right onto it. At your own risk, of course, because no one knows if and when the volcano may surprise both locals and visitors but the thrilling experience attracts many people, usually for a day trip. Nisyros belongs to the Dodecanese island group but it is not the typical beach holiday destination as its volcanic beaches are not much of attraction to everyone. It is small and almost entirely occupied by the volcano. 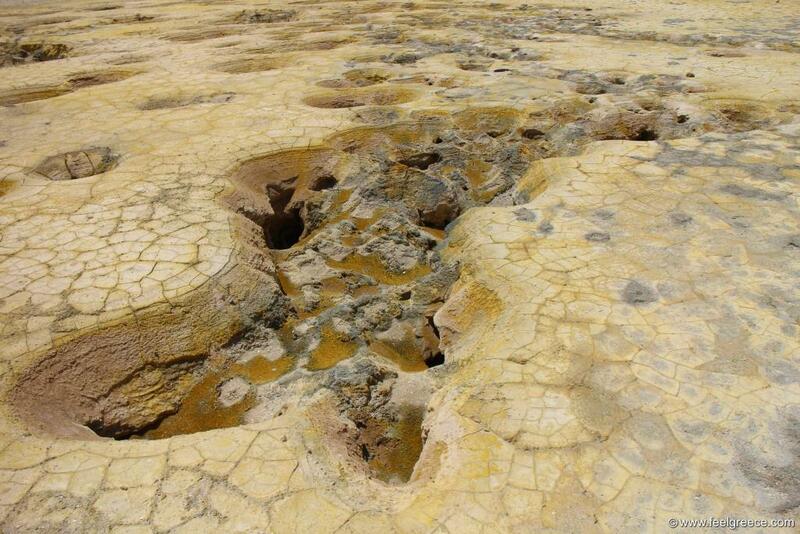 The craters are in the center of the island, in the middle of a depression called Lakki plain, colored in yellow and ochre and surrounded by the caldera. 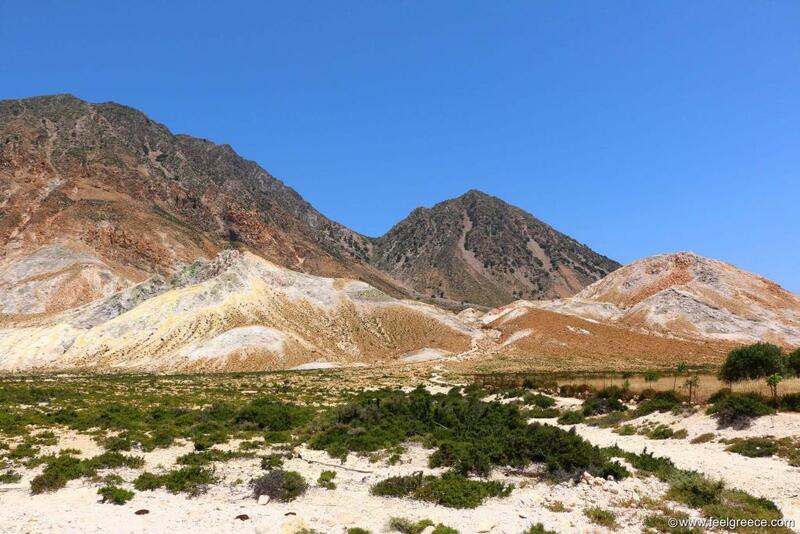 Nisyros volcano is considered dormant, i.e. sleeping, because the last eruption was more than a century ago but steam is still puffed out of its openings and the smell of sulfur is everywhere around. In Lakki plain there are a few craters but the point of interest is the largest of them - Stefanos. 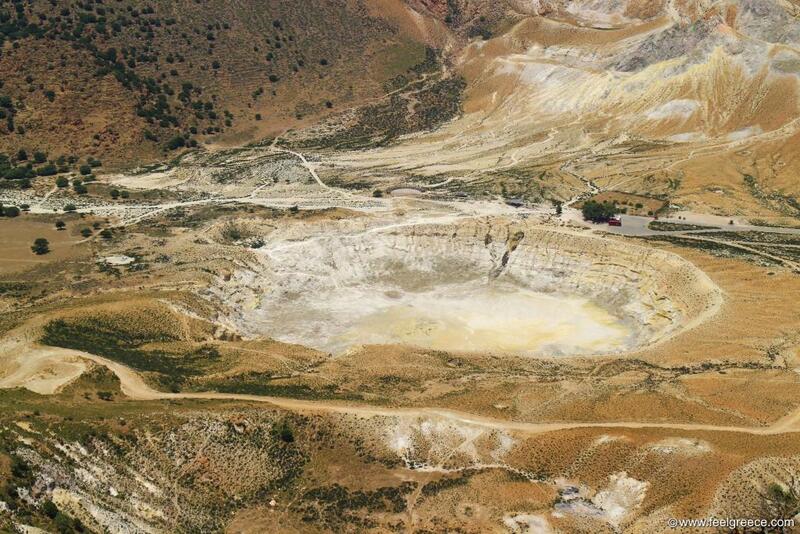 Stefanos is a big hole, approximately 25 high and 300 meters wide. The very center of the crater floor is fenced and there you can see small fumaroles, rough openings with steam coming out of them. 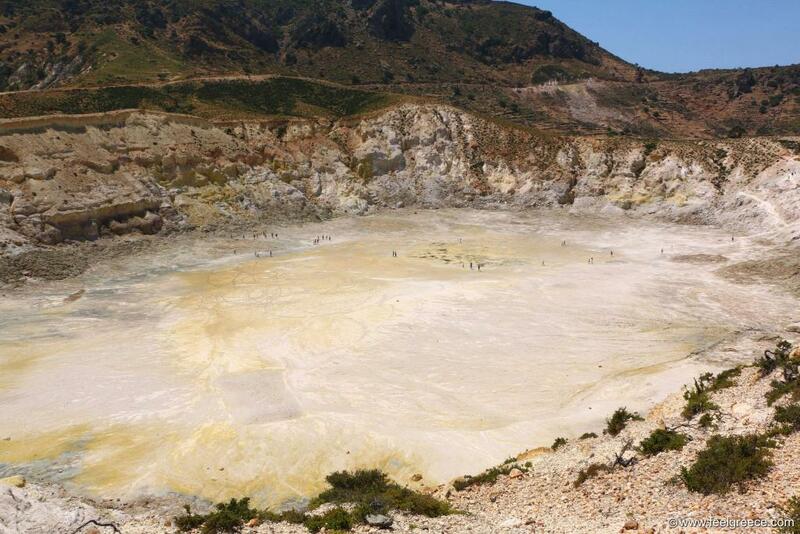 Beneath the volcano surface runs a hydrothermal system which results in hot springs gushing at some places around Nysiros coast. Most visitors come from Kos for a daily trip, there is a ferry from Kardamena village on a regular basis in the summer and it transfers mainly organized groups but you can go on your own and even take a vehicle (there is space for 1-2 cars and for motorbikes). The ferry departs from Kos in the morning and comes back in the late afternoon. 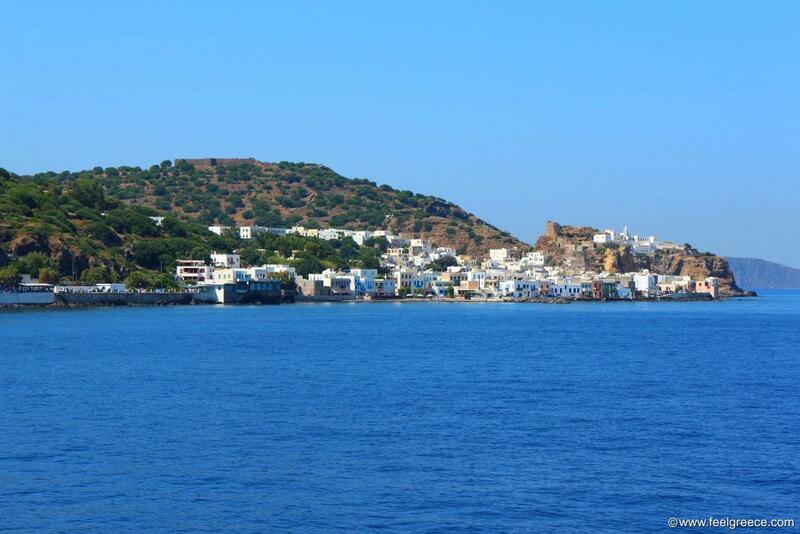 On Nisyros it arrives at Mandraki - the main village of the island and after that you have a few options. If you are part of a group, there will be a bus waiting for you, it will take you to the volcano and after that will drop you back at Mandraki where you can spend a few hours dining out, walking around or visiting the Monastery of Panagia Spiliani. If you are with your own vehicle, you can do whatever you want and be back on time for the return. If on foot, you can take advantage of the local taxi or car rental service. There are enough signs to guide you and the distances are small (5-6 km in any direction). Nisyros is also connected via ferry with the islands of Rhodes and Tilos, and with the port of Piraues but the service runs a few times weekly. When you reach the Lakki plain, you will first pass by the small cantina which collects the entrance fee (EUR 3 per person) and sells drinks and souvenirs from the volcano. 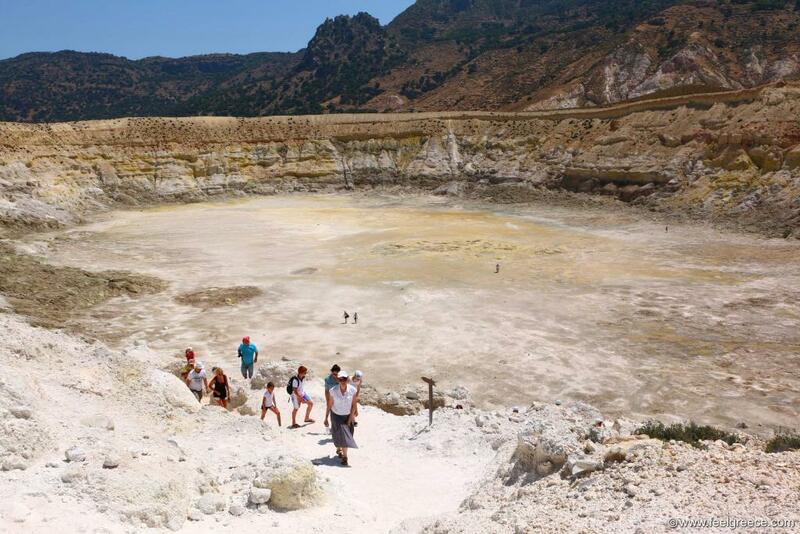 There is a hiking trail around Stefanos so you can take photos from above and in one of the crater`s ends a narrow path descends down to the floor. Before you descend, you will see the warning signs telling you that going down is at your responsibility. Do we need to say that those who have already come to see Stefanos all go down? If during your visit you feel your soles burning, it is not just your imagination playing tricks and it is not in your head - the surface of the crater and the entire Lakki plain may feel quite hot as the hydrothermal system running right underneath the plain is about 100 degrees C. Don`t worry, your shoes will not be set on fire but flip flops or very thin soles may give unpleasant feeling. 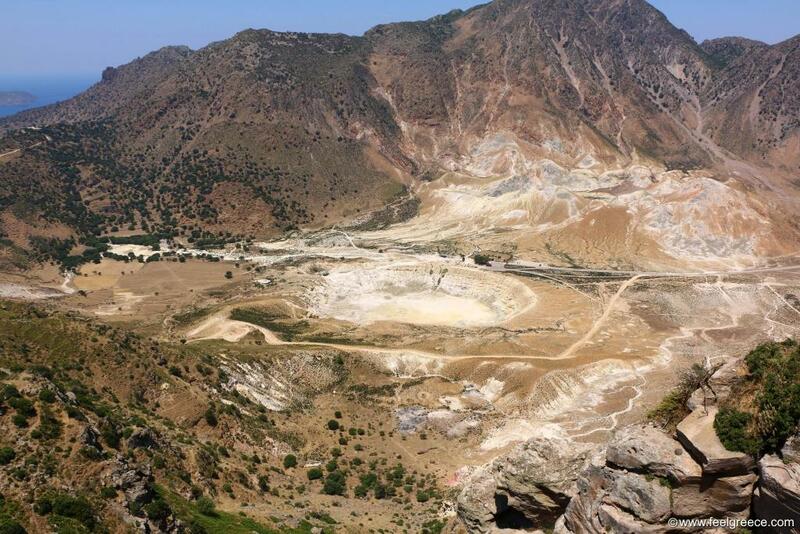 The strong sulfur smell can be scent as soon as you enter the valley and gets more intense around the center. Two more craters called Alexandros and Polyvotis are very close to Stefanos and you can see narrow trails going here and there but approaching them is not recommended because of breakable soil and risk of burning. 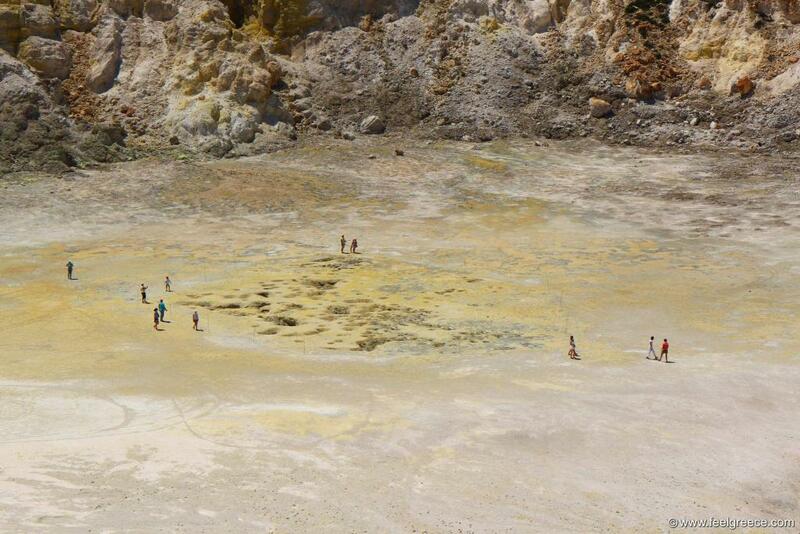 Not all aerial photos of the crater are taken by drone. Panoramic views to Stefanos and Lakki plain are available from Nikia and Emporios, the two caldera-rim villages of Nisyros. You will also see the plain while approaching it, as the road descends for about a kilometer. Unpaved road going along Stefanos and up leads to the Monastery of Stavros at the caldera rim which provides a great view of the entire depression and the craters. 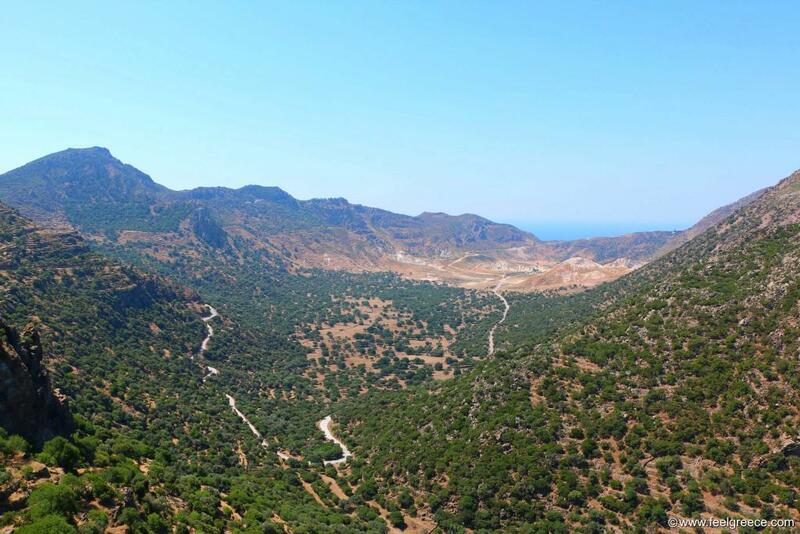 Apart from Lakki plain, the rest of Nisyros is greener and there are a few settlements to accommodate you. Mandraki and Pali are by the sea and they provide the greatest choice of facilities for the island size. Nikia and Emporios are inland and offer mainly villas with sea view to rent (by the way, in Emporios you can visit a natural sauna cave). 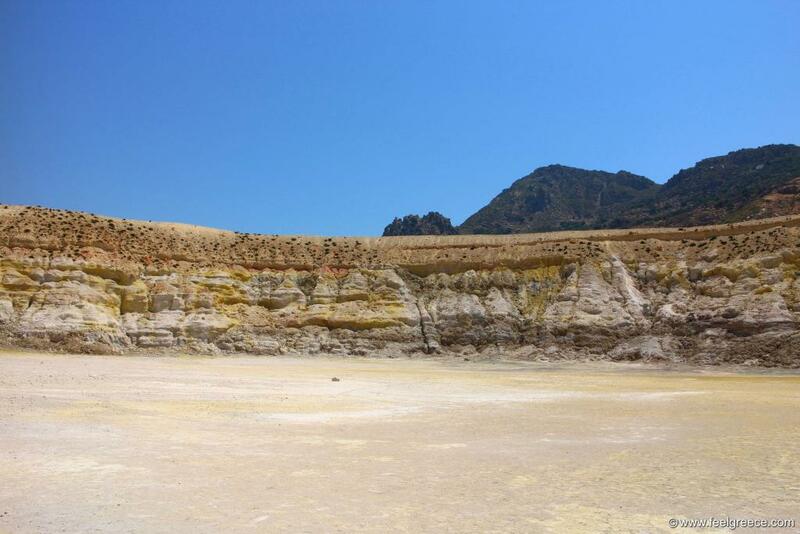 As mentioned before, Nisyros is not much attractive for a beach holiday although it does have beaches - they just do not suit the taste of people used to soft yellow sand. The beaches of this island are either pebbly or covered with coarse dark grey to black sand, and some of them have hot springs or strange rock formations as a gift from the volcanic activity in the past. If you want to have the entire beach for yourself, this is possible on Nisyros, especially on the east side below Pali where the beach strip runs uninterrupted for a few kilometers. Hikers will be happy to find out they can make a full round of the island, as part of the route includes walking on the caldera rim and stumbling upon weird lava formations and outstanding white chapels. 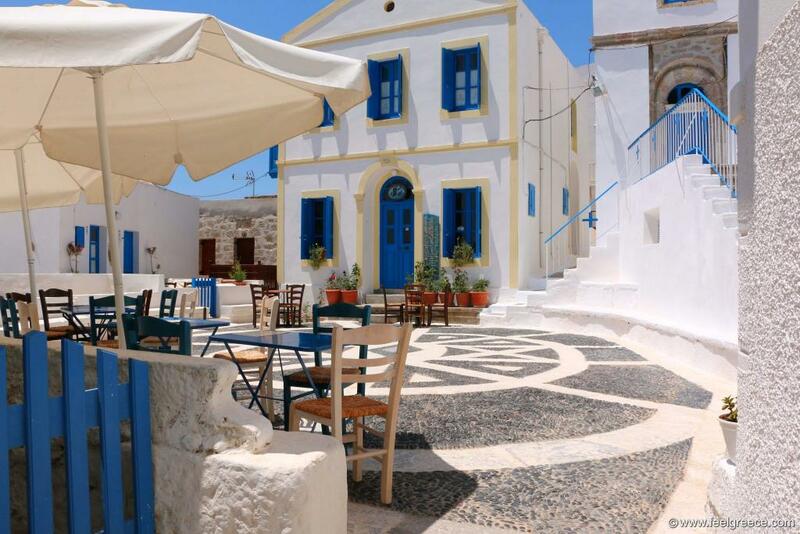 Even if you visit the island just for a day, a trip to Nisyros is something you will definitely remember!